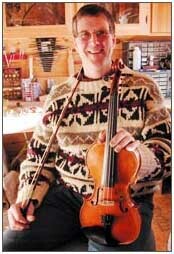 Don learned how to play the fiddle from his Uncle, Lucien Mathieu when he was 15 years old, and soon after became influenced by his fiddling friends Ben Guillemette, Joe and Gerry Robichaud, and Graham Townsend. His personal style would show strong influence from the Canadian provinces and Northern Ireland. Don started and managed The Maine French Fiddlers with his wife Cindy, an accomplished piano accompanist and stepdancer, for 11 years during which he played such venues as Carnegie Hall, Lincoln Center, The Barns at Wolf Trap, Prairie Home Companion. His latest recording, “Thanks for the Lift”, is a collection of rare tunes learned from his mentors and has been nominated for a National Heritage Award.